I’ve had a varied week. 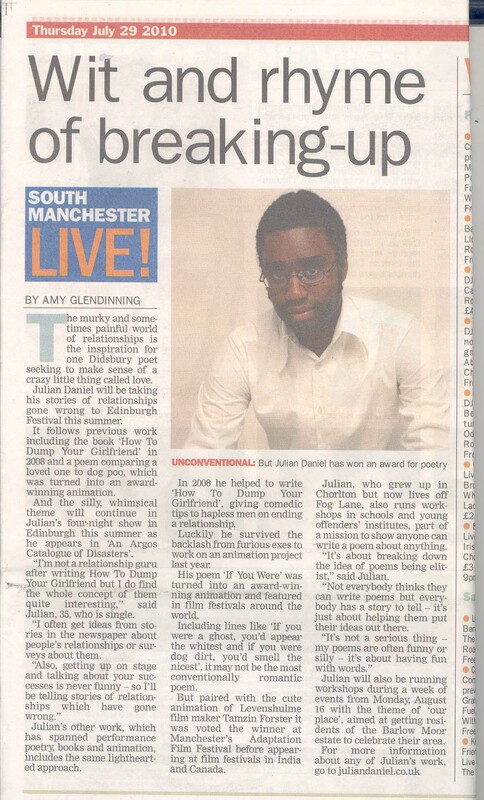 As I mentioned recently I have appeared in my local newspaper, the South Manchester Reporter twice in the last month. Despite being a bit crap when it comes to technology, I’ve managed to scan the articles, so those unfortunate enough to live outside of South Manchester have the chance to see the articles. (article 1) and (who’s who article). I mention these articles, not to show off (honest) but because on the way to watch the Switzerland vs England game, a bloke walking towards me, wearing shorts and carrying a plastic bag looked at me and just as we passed each other, he spat on the ground and then said “Are you a bit of a comedian?” I said “yep, a bit of a comedian”. I thought if he wasn’t going to commit to me being a full comedian, then it would probably be a social faux pas for me to do so. He then went on to say he’d seen me in the paper, which just goes to show the power of the local media. To be honest I’m just glad he didn’t want to beat me up. As for the football, it brought me some money. In particularly Wayne Rooney won me some money, admittedly I didn’t get as much money off the back of Wayne Rooney as some we have learnt about in recent times. But after his recent publicity I thought I’d put some money on him being the first scorer against the Swiss. It was only when Rooney scored the first goal, that I thought maybe I’d should have put on more money than the £1:25 at 4-1 that I actually did. And before you ask, yes I did feel a bit of a tw@t putting such a small bet on in the bookers. I put the bet on in hushed tones, just in case anyone overheard. I felt a little bit more confident, when I went in the next day to collect my winnings, all £5 of them (plus my stake). I was wary not to go crazy and blow all my winnings in one go. Instead I bought some toothpaste £1, renewed a DVD from the library £1, then I bought tinned tomatoes, mushrooms and bacon from a supermarket and I still had some change left, although I think by the time I bought a cup of tea in a cafe, I’d exceeded my winnings. As some of you may know I’m constantly thinking of ways to advance my global appeal. Well inspiration hit last week. I’m not sure what triggered it off, but I had a thought that around this time next year I could hold an ‘International Burn Tony Blair’s book day’. I could grow a ridiculous moustache and promote the event on the side of a tacky trailer. The only problem is that I don’t want to buy the book so I’ll have to find a library that stocks the book and burn it in there. I suppose I’ve got a year to iron out these teething problems. And Finally…. Here’s a little insight into my personal life, I decided I should do some stretches last week, as it would make me more supple. So I did some intense stretches on my hamstrings. I then spent the next 3 days walking around with tight hamstrings. I think I might just stick to gambling. Welcome to my new home. That’s right I’ve moved my blog from its previous home to this one. Don’t worry nothing else will change, it will still be updated on a Monday unless I can’t for whatever reason and it will still contain the usual nonsense. I spent most of last week transferring the posts from the old blog to this one, meaning I was sat at the computer for quite a number of hours doing mundane tasks, it was like having a proper job. Naturally it didn’t go smoothly, mainly because I am an idiot and I accidentally saved some posts as drafts and not publishing them as intended. This meant that some posts were out of synch, so I had to delete some posts that I had already taken time and effort to transfer. I’ve said it before and I’ll probably say it again, it’s not all glamour this showbiz malarkey. Anyway, knowing this I still did it, so I wonder what that says about me. To my surprise and a little trepidation I saw ‘Argos Catalogue of Disasters’ was attached to a Guardian article. I clicked on and it was an article about comedians who do poetry and poets that do comedy, or something like that, I didn’t really read the article, I was trying to find out what was said about the show. We weren’t in the main article but we were in the comments section (see here, scroll down to McMole 28th Aug 11:16AM). I won’t give it away as to whether it was positive or negative feedback but I will say, “Thanks for slagging us of McMole”/”Thanks for the kind words McMole” (delete where applicable). 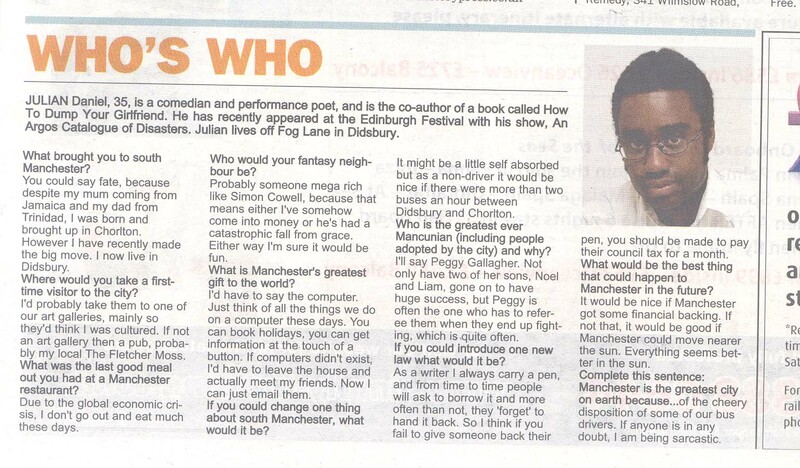 Talking of newspapers I made it into my local newspaper the South Manchester Reporter in a section called Who’s Who? it’s where local movers and shakers (and unknown comedians) answer a series of questions about Manchester. It was a nice write-up and it’s always good to get a bit of publicity but it’s interesting how taking out one word can change the whole meaning of a sentence. For example, one of the questions they asked me was “What would be the best thing that could happen to Manchester in the future?” I wrote in my original response, “It would be nice if Man City got some financial backing”. The joke being, Man City are the richest club in the World. However, it appeared in the article as “It would be nice if Manchester got some financial backing”, which makes me sound as if I’m concerned about the funding streams for Manchester council, which I’m not. Not to worry. Now on to politics, as it was a busy week for politics what with Tony Blair’s book coming out. It’s cover price is £25 that’s TWENTY FIVE of your hard earned English pounds. In the book, he reveals that he had a fractious relationship with Gordon Brown, who knew? He also reveals he doesn’t regret his decision to invade Iraq, who knew. I think he also speculates that the Earth is spherical. That’ll be £25 thanks. The other big political news involves William Hague (49) and the fact that he shared hotel rooms with his aide Christopher Myers (24) on a number of occasions whilst on political trips. Some cynical people put 2+2 together and come up with gay. William Hague then felt he had to make a statement to prove he’s not gay, but it’s not easy to prove you’re not something. He then went on to mention his wife and her multiple miscarriages, which I think is over stepping the mark. If you are in the public eye and your other half isn’t I don’t think you should bring them into the public arena. I was explaining this to ‘Her With One Permanent Job’ just the other day. And Finally… I was watching a programme, ‘My favourite Year’, the year in question was 2000. In it, it mentioned Tony Martin who was convicted after shooting and killing an intruder. It also mentioned Barry George who was sent down for the murder of Jill Dando (he was acquitted of this in 2008 after a retrial). I think the one thing we can learn from these 2 things is that we shouldn’t trust people with two first names. Hola. Hope you are well and had a good Bank holiday weekend. I’ve had a relatively quiet week, taking it easy after Edinburgh. I had one writing workshop to do and I also went to an actual football match in an actual football stadium. During the workshop I had one of those ‘little victories’ that I believe life is built upon. I had to get the people attending the workshop to describe an activity they do as if it were a recipe, which isn’t something you do everyday. After they did this, I asked them, “How did they find that”? As the words were leaving my mouth, I did start thinking, is this a good question to ask, as it does leave me open to negative feedback. It’s one of the reasons I don’t ask the question “Do you love me”? The other reason I don’t ask that question, is that I’M NOT A WOMAN. Anyway back to the workshop, after a brief pause, one of the attendees said, “It was difficult, but due to the exercises I’d set, he was able to do it.” Then like that scene in Spartacus, others stepped forward and said similar things. This was nice, especially as the person who booked me was in the room. It made me look like someone who knows what he is doing, which isn’t always how I feel. Like most people, I sometimes feel unsure about my abilities or out of my depth. I imagine most people get like this, Jimi Hendrix at some point probably thought, is the guitar for me, Sir Alex Ferguson from time to time probably questions his ability as a football manager, Nick Clegg probably wakes up every morning and thinks he’s out of his depth as Deputy Leader. Maybe the latter isn’t the best example I could have chosen. Talking of Edinburgh as I did briefly at the top of the page, I met up with Marvin Cheeseman outside a pub in city centre Manchester last week, to do a cash drop off. To onlookers it probably looked like an unlikely dodgy deal. I mention this meeting because after our successful three dates at the Edinburgh Festival you would think on seeing Marvin and I together people would have been tooting their horns at us, pedestrians would be high fiving us and maybe carrying us on their shoulders through the streets of Manchester. But we got nothing. What do you have to do to get some attention round here, stick a cat in a wheely bin??? Onto other matters, a few weeks ago I mentioned how I had to sit through two soppy movies, ‘Before Sunset’ and ‘Before Sunrise’ (see here). Well I inadvertently got my own back on ‘Her With One Permanent Job’. She likes the Coen brothers’ movies so I got ‘No Country for Old Men’ out of the library, (£1 for a week) all I will say is this isn’t a first date movie. There must be over 20 deaths in this film, including a couple of dogs. I suppose it could be a good drinking game movie, you could take a swig of alcohol every time someone dies. By the end of the film you would be p*ssed, so maybe it would be a good first date movie after all. And Finally… I never really fancied Elin Woods (Nordegren), that was until last week, when she got her divorce settlement from Tiger. There’s something about a woman inheriting £64m that makes them somewhat alluring. I wonder if she drinks and likes violent movies?? ?